Kristen and I spent a few hours on the boat after picking up the keys, and then the next day all four of us spent half the day on the boat. So at this point, we are feeling pretty up on the ways of boat living, and can offer an impartial analysis of living on a boat, vs living in a house. Boat: A lot of family activity revolves around the kitchen, and the boat is no exception. The boat has a highly functional kitchen, called a galley in boat geek. It is so efficient, that only a single person need stand in a single spot, and he or she will have full command of every aspect of the galley. This culinary wizard can reach literally every corner of the kitchen without taking more than a single, small step. Additionally, there are hard mounts within the galley where you can attach a strap to keep yourself secure in heavy seas. Also, they allow parents to strap their children into the galley until the dishes are complete. Rounding this out, the stove has contraptions called fiddles, which keep the pots and pans firmly secured on top of the stove, which is very handy in earthquake prone locations. House: Our current house has a kitchen so vast that it takes three or four people to fully populate it. One person to operate the sink, another the stove, and another one or two, or three people, have operating stations at various counters. While vast quantities of food can be prepared by such a crew, it really is a bit overkill for a family of four. Furthermore, the refrigerator actually opens out from the front, causing massive amounts of cold air to spill onto the floor and cool ones feet on a hot Summer day. Don't even get me started about all of the dirty dishes in the dishwasher, sometimes held overnight. Nothing is ever clean! Boat: My calculations put the boat around 450 sq feet of living space, vs the house at around 2700. With three bedrooms, two baths, an office, sleeping for ten, and cozy reading nooks, it is clear the boat is a marvel of ingenuity. 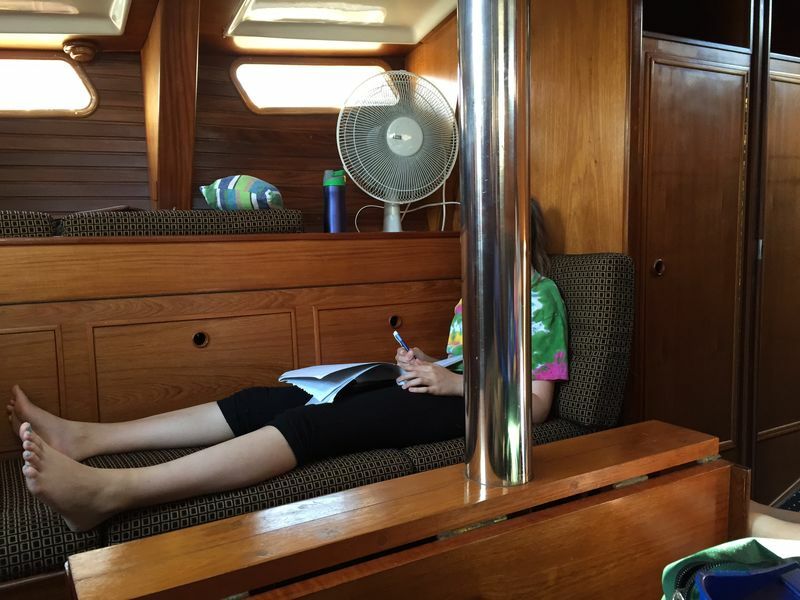 All furniture has been so finely crafted and integrated with the core structure of the boat, that you almost don't even notice that you have furniture, except for all of the mystery bruises on your shins and ankles. We also have an exercise pole, which doubles as a room divider if you desire a bit of privacy. House: It is so big and spacious, that it is essentially impossible to hear, see and smell everyone all the time. It is disturbing to not know what is going on. For example, if you are upstairs in your room with your spouse, door locked, and the kids are downstairs watching a loud movie, neither parties can hear the other, at all! That is no way for a family to live. Boat: Two bathrooms, each with fully integrated showers. It is like being inside of a Transformer. First you are brushing your teeth, now using the toilet, and now taking a shower, all within the same 6 sqaure feet! Truly amazing. And, get this, the sink faucet is attached is a hose, pulls out, and mounts on the wall for head height cleansing! House: While there are three bathrooms in the house, they are so differently configured that it becomes quite confusing to switch between them. For example, after spending many hours learning and understanding the master bathroom, with the seperate stand up shower stall, it is very disorienting to then use the children's bathroom with a bathtube for a shower. Nothing is the same place, and it is really hard to reach everywhere at once. In fact, it is essentially impossible. You must take at least one step to get everywhere, sometimes more! Boat: The roof of our boat, topped with approximately five hundred thin strips of wood, caulked at each seam so we can recaulk them later when they leak, screwed to the deck with thousands of screws, each penetrating into the soft wooden layer core show casing capillary action, provides for excellent footing when walked upon, at least as long as the sun is not shining, because when it is shining, it is bloody hot. Additionally, there are a bazillian bits of hardware sticking up out of the roof, and dozens of wires and ropes all over the place, making for excellent circus training. House: Interlocking metal plates form an essentially lifetime roof that will outlast the house. Alas, it is a tragic, shocking blue. Boat: When at anchor, getting to and from the boat requires taking a smaller boat, sometimes through waves and surf, to get a beer. But even before landing the beer, you must walk across sun baked sand, dodge concussion inducing falling cocunts, and through mostly naked people in bathing suits in the baking heat of Mexico in December. Then you have to take that same little boat back through the waves and surf to get home. Occassionally you can get delayed by cleaning the guts out of freshly caught fish and crabs, sunsets, and bonfires. Getting from place to place is slow, sometimes wet and cold. You can almost walk faster. People are constantly gawking at you, and all of your laundry is dried out in plain view of everyone. You also do you laundry in a bucket. Finally, sleep can be elusive as the boat is rocked side to side by small waves. House: With our current house, we can walk to our dentist, eye doctor, three breweries, about fifteen restaurants, the beach, and an excellent theater. The school system is highly rated, the neighbors have nice cars, and the house is firmly anchored to the earth. Additionally there is American Infinite power to keep those screens running and the AC on. Final Verdict: House. If you want to go somewhere exotic, take a plane.